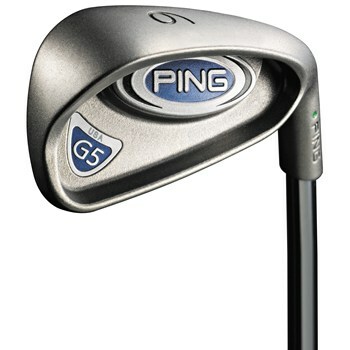 The Ping G5 irons feature a deep cavity back and extended perimeter weighting for awesome forgiveness. The wider sole and thinner, larger Custom Tuning Port (CTP) allows for a high, penetrating trajectory, with a solid, responsive feel on any solidly struck shot. The expanded surface area covered by the larger Custom Tuning Port (CTP) stabilizes the face for more consistent feel and performance at impact. The wider sole allows the center of gravity to be lower and deeper, creating a higher launch and more forgiveness. Two uniform cavities re-distributes weight to the clubhead''s extremes to maximize forgiveness.